Know a Young Scientist or Young Leader? Nominate a student and a young adult who stands out in your community! The Applecross Rotary is looking to sponsor students and young adults for two of our upcoming programmes. Let Suresh know the university and dates your nominee would like to attend. Two students will be selected based on merit and local involvement. Rotary Youth Leadership Awards recognise outstanding young adults age 18 to 24. Our Applecross Rotary Club is looking for to sponsor and register one more leader before 15 November 2018. 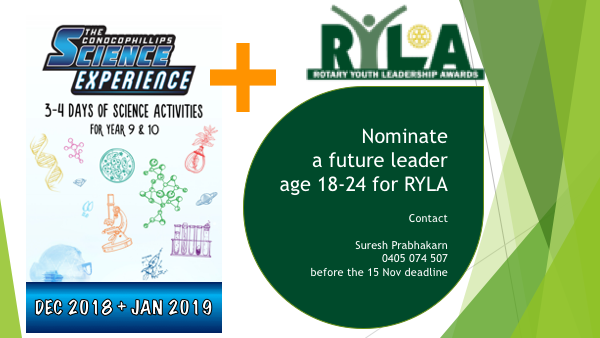 To nominate, contact Suresh Prabhakaran, our Youth Director.